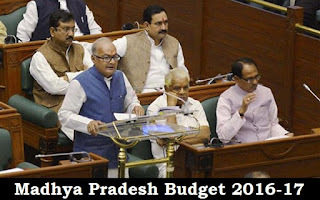 Madhya Pradesh (MP) Budget 2016-17, मध्यप्रदेश बजट 2016-17 Highlights: Madhya Pradesh Finance Minister Finance Minister Jayant Malaiya on 26 February 2016 presented the Annual State Budget 2016-17 in the legislative assembly. The finance minister announced a total expenditure of 158713.04 crore rupees for the year 2016-17 and appropriation of 170753.99 crore rupees. Madhya Pradesh government announced reducing VAT on a number of items such as CSD cars, soya milk and dialysis machine, while making battery-operated vehicles tax-free in the budget for 2016-17. Total expenditure of ` 158713.04 crore for the year 2016-17 and appropriation of ` 170753.99 crore. Revenue surplus of ` 3509.81 crore for the year 2016-17. Fiscal Deficit for the year 2016-17 is estimated to be ` 24913.64 crore. Targets set under the Madhya Pradesh Fiscal Responsibility and Budget Management Act, 2005 are expected to be met. Total Revenue Receipts for the year 2016-17 are estimated to be ` 126095.14 crore. Components of the Revenue Receipts are ` 46500.00 crore as State’s Own Tax Revenue; ` 43676.36 crore as share in Central Taxes; ` 11481.63 crore as State’s Own Non-Tax Revenue and ` 24437.15 crore of Central Grants. State’s Own Tax Revenue estimates are 93.92 percent higher as compared to 2015-16. Revenue Expenditure of ` 122585.33 crore is estimated for the year 2016-17 which is ` 13750.40 crore more than ` 18834.92 crore for the year 2015-16. Opening balance of ` (-)34.83 crore is estimated for the year 2016-17. Net transactions during the year are estimated to be ` (-)118.56 crore. Hence, closing balance at the end of the year is estimated to be ` (-)153.39 crore. Plan expenditure for the year 2016-17 is estimated to be ` 74401.69 crore as against ` 60348.88 crore for the year 2015-16. Thus, an increase of ` 14052.8 crore is estimated in Plan expenditure. Budget estimates of Tribal sub-plan have increased from ` 12894.49 crore for the year 2015-16 to `16200.02. Budget estimates of Scheduled caste sub-plan have increased from ` 9084.96 crore for the year 2015-16 to ` 11781.53 crore for the year 2016-17. Fiscal Deficit estimated at 3.49 percent of GSDP. Revenue Surplus estimated at 0.49 percent of GSDP. Interest payments estimated at 8.11 percent of Revenue Receipts. Inter-caste marriage promotion scheme - To promote inter-caste marriages monetary incentive was increase by four times. Earlier, couples used to get 50000 rupees, which will now go up to 2 lakh rupees. This scheme aims at eliminating untouchability. The state has a substantial population of Scheduled Castes. The budget also proposes a hefty increase in VAT on plastic products. Usha Kiran Kendra – It will be set to in every district of the state with an aim of empowering women. It will be established on the lines of One Stop Crisis Centers. These centers will provide legal and economic help to victims of domestic violence. Ladli Laxmi Yojana – 903 rupees was earmarked for the scheme, under which more than 21 lakh girls has been benefitted till date.